The NinjaTrader Alarm Manager is a Personal Trading & Risk Management Assistant for your PC or VPS that will carry out any number of automated actions such as managing positions, sending email’s, instant SMS messages, Telegram Bot broadcasts, Voice alerts and pop-up messages together with real-time news impact integration and important information at your finger-tips with configurable Web feeds. Traders can create rule-based alarms which trigger any number of actions. The software can notify the trader about events, carry out trading actions such as closing existing positions. 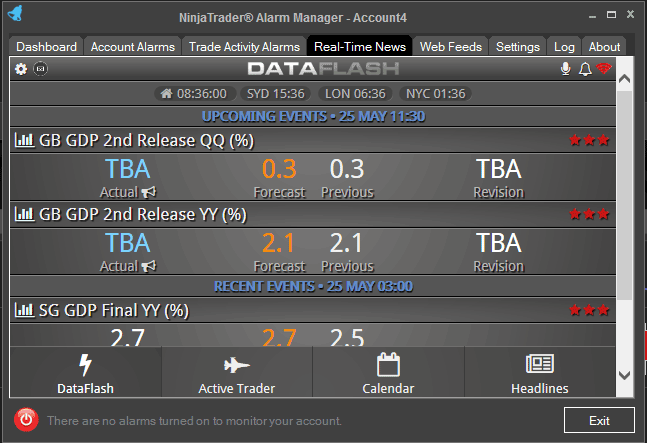 The NinjaTrader Alarm Manager is a Personal Trading & Risk Management Assistant for your PC or VPS that will carry out any number of automated actions such as managing positions, sending email’s, instant SMS messages, Telegram Bot broadcasts, Voice alerts and pop-up messages together with real-time news impact integration and important information at your fingertips with configurable Web feeds. Traders can create rule-based alarms which trigger any number of actions. The software can notify the trader about events, carry out trading actions such as closing existing positions. The link below will open a YouTube video and show you a tutorial on how to install the Add-On into the NinjaTrader platform. 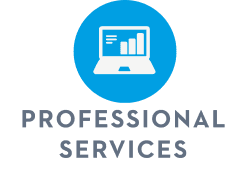 "This is the Perfect Risk Management Tool"
"We provide a 2nd license for you to use on another PC or your VPS"
The maximum value for the gauge can be changed in the settings up to any value up to 100. We have built the alarm manager to cover all scenarios while trading from staring at the charts for many hours to going shopping for your favourite handbag. Simple and easy FREE service that will allow you to broadcast the alarms from the Alarm Manager to your messenger bot. The benefit of this service is that you can install the Telegram Messenger application on your Phone, PC or Web browser and never miss out on an important trade notification. If you do not want to use the Telegram Messenger service, then the fastest method of getting informed when an event occurs is to use good old SMS messages straight to your mobile phone wherever you are. "By changing the message and voices you can personalize the application to suit your country of origin." When a position opens a voice, the message will say ‘A position has just opened” in English. Account and Trade activity voice alerts can be very useful when you are multi-tasking, sometimes having a friendly voice telling you a pending limit order has just been filled can be very useful. We have integrated real-time news into the application which comes from News Impact. This service is free with some advertisements and is an invaluable tool where you will be informed minutes and seconds before a major news release via voice. If you become a premium user with News Impact, the advertisements are removed. Market-moving economic news for all major economic regions covering all the key macroeconomic indicators. Read more about How to Trade Forex on News Releases. The fastest possible economic data delivery ever made available to the retail trader. Be among the first traders who know all the important economic figures. Carefully designed to provide the most important data points with just a glimpse of an eye. Easy to read and fast interpret. Their data delivery service is based on a financial world proved real-time messaging architecture which guarantees no missing piece of data delivered with low latency. You can stay assured that when an economic figure is released you will be among the first to know. You have the option to subscribe to News-Impact to remove the advertisements. The web feeds section allows you to get instant access to market information from various websites that have the best and most up-to-date data and news. We provide a list of default sites that we feel are very useful, you will also have the option to modify and add your own personal custom website feeds. 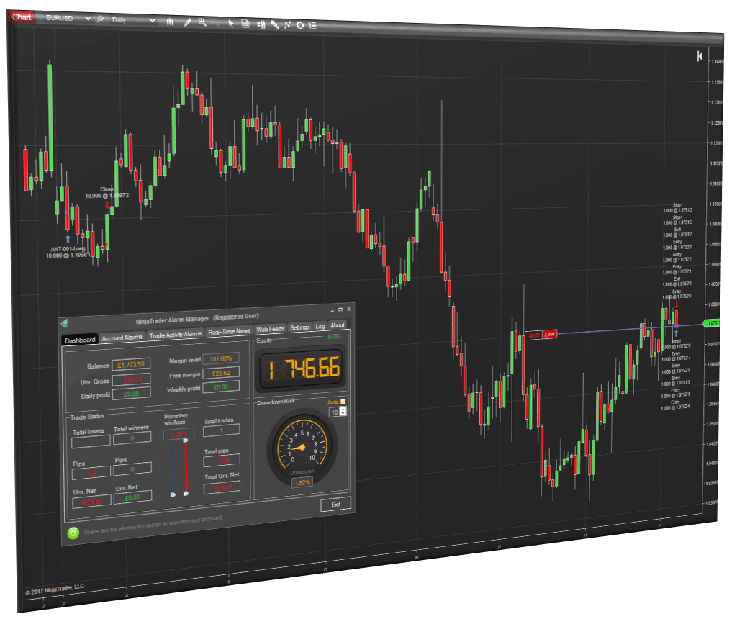 This section will allow you to test your email settings with NinjaTrader, connect to your accounts, set-up the SMS & Telegram services to receive instant messages, test it works by entering your mobile number and other general settings. We provide different SMS packages where you purchase only the SMS credits you need; they do not expire and you can use them as much or as little as you wish. This service is to allow you to receive the alert message to the phone number you specify. You do not get charged to receive them. You will receive 5 FREE SMS credits with the trial version. Setting up your Telegram Messenger bot is very easy, please read our blog on the link below to get you all set-up. To test the service just click on the button and a message will be sent straight to any device which has the Telegram software installed.